Considering the bathroom is likely to be the place you both start end your day, creating a space where you can feel at ease and relaxed is always desired. With a little help and advice, you can create a space that resembles a spa so relaxation is fely every time you enter the room. By adding greenery to your bathroom, not only do you create a more spa-like atmosphere, but you add freshness to the room. Choose plants that thrive in low lighting and less ventilation. Aloe, spider plants, moss, lavender, house trees, ferns, and other similar plants will do best. Use light neutrals and earth tones. Grays, whites, creams, blues, greens, and even light shades of brown are always nice colors to add in a bathroom. It will make it seem more earthy and relaxing. Use textured linens that add softness and interest to the room. Opt for a woven or canvas shower curtain and soft plush towels. Keep the bathroom décor simple and practical. Don’t over clutter the room or it will become cluttered and overwhelming. Add pops of bright colors. Pops of orange, green and pink add enough character to the room when neutral tones are used as the foundation. Carefully consider the presentation of the room. Does everything flow well together? Does it have cohesiveness? Put all bathroom utensils such as hair products and toiletries away. Use baskets and cabinets to store away unsightly items. Create a dramatic look with candles, stones in vases, and other pretty yet simple finds. Find a unique piece of wall art to display. Add a conversation piece or something that will surprise your guests with visual appeal. Add a sound machine to the bathroom. Play nature sounds such as ocean noise or rainforest sounds to create a more natural and spa-like environment. Have a magazine stand of books set out on a cabinet. 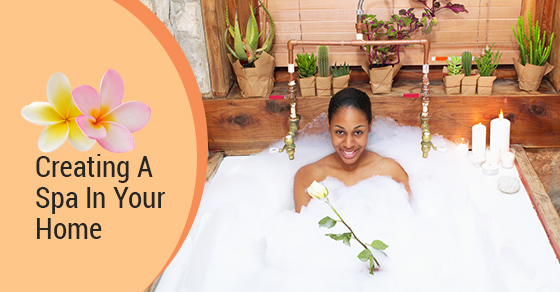 There are many creative and innovative ways to spruce up the bathroom and create a spa-like atmosphere. By following the tips above and even coming up with some of your own ideas, you can create a bathroom that you never want to leave. Contact Avonlea to help your serene bathroom become a reality.